Pink to make the boys wink you feel effortlessly feminine and not look like Barbie. 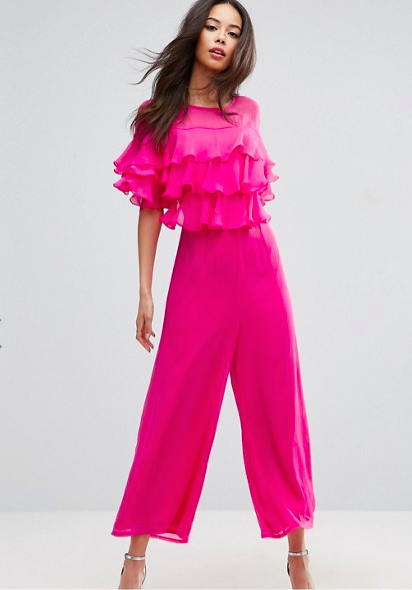 This Spring's trend of pink is making itself very obvious across high-street windows, cover pages and any trend spotting article you've read. Gigi's wearing it, Kate's wearing it, my Nana's wearing it, everyone is wearing pink. It's fun, bold, exciting and available in hundreds of shades so why are you so scared to take the plunge? Pink seems to be associated with super girly and feminine women when at the moment everyone wants to be a little bit more edgy, still obsessed with sportswear and i'm still waiting for it to catch on in Edinburgh. Please believe me when I say pink can be anything you make it. You could go out in a full pink outfit and nobody would bat an eye- it's just how you dress it. If you LOVE pink and are super excited to get involved, amazing! If you're very on the fence and don't want to look super girly and it's not your usual colour then have no fear these trend tips will help you slowly introduce it into your wardrobe. 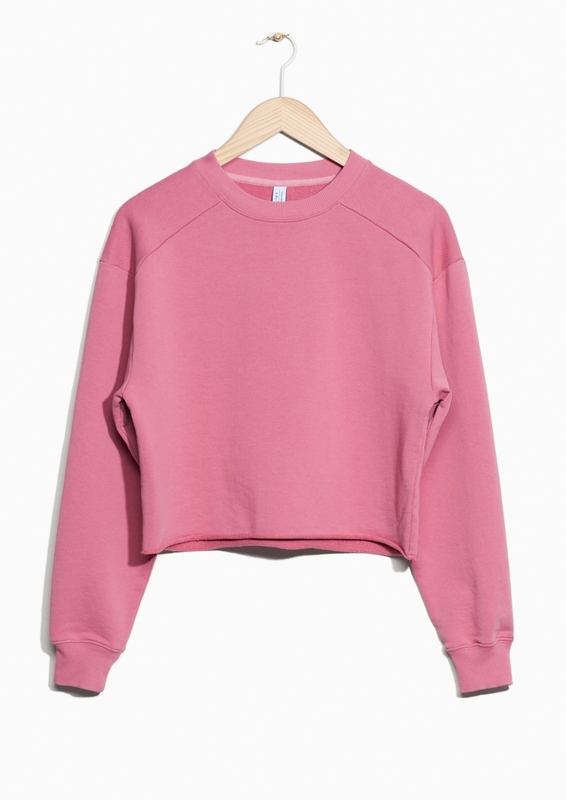 This 90's raspberry pink raw edged jumper is IDEAL for you gals still loving the sportswear trend. It's fun, can be worn with some smart jogger style trousers, a bold yellow shirt underneath so the collar is peaking through or with a denim skirt as featured on the model. Trainers, shiny boots, metallic brogues. It's a solid staple. These cropped trousers are the perfect mix between a little masculinity but obviously they're bright pink so are super smart. 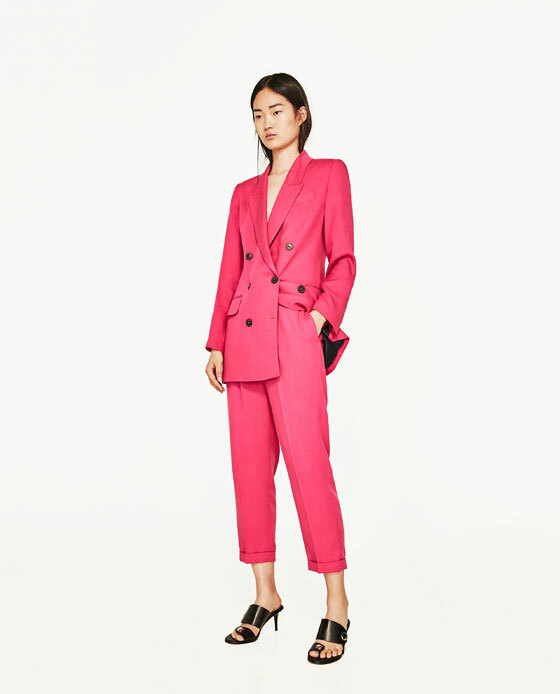 The model wears it with the matching long-line blazer which is sooo lush but if that's not your thing you could easy wear them with a furry mule and a white shirt with a printed bag or even a grey t-shirt, heels and a leather jacket would look really fresh. This is the cutest pink dress i've seen so far this season. The sleeve, the length, the frill- everything is so perfect I bought it as soon as I saw it. The bubblegum isn't overwhelming to see because it's got that mid-sleeve so don't panic that it's one colour. The red lip on the model is a perfect clash and those boots are keeping it a very cool. I'd wear it with black suede and maybe a tortoise heel boot with my leopard print side bag or black fluffy bag if i'm going out. Ideal with a duster coat too with a leather backpack and black trainers with a fishnet or sparkly sock. 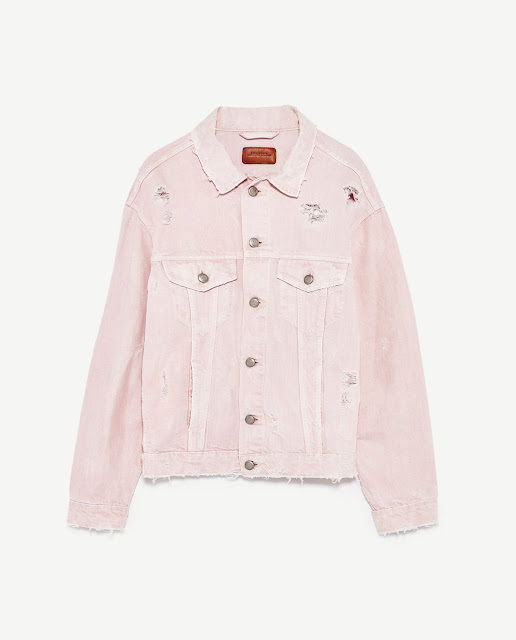 This raw dusty pink jacket is good for you if you're really unsure about this trend. Because it's so pale and has a bit more going on with the raw detailing and buttons, you can wear it as much you would your black or blue denim jacket lurking in your wardrobe. Don't be put off by the model wearing it with the jeans to match- you can wear this with ANYTHING and look like you've got a bit more going on in your outfit. This is the shocking pink I will never not love. It's bold, it's fun and it's just a bit wild for everyday. The leg is beautiful and those frills on the torso and sleeve are stunning. I swear you'd feel a million dollars in this. A lot of people are still worried about this awkward length of leg out of fear it will shorten them but please do try and experiment because I never thought id be able to wear this length at 5"1 and I wear it nearly everyday now. Get a cheeky leather with this and a super dark smokey eye, matching fuchsia lip and patent or metallic heels you're gunna be looking SO fit. Here's a bit of insider knowledge: cropped jackets with sleeve details are going to be worn by everyone. If you don't have one by the end of June i'll be really surprised. 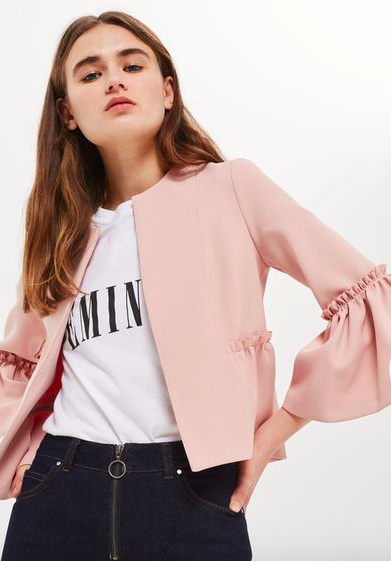 Get way ahead of the game with this super sweet Topshop cropped jacket. Ideal for everyday, day-to-night or for an occasion. I love love love the fact it doesn't close so you can't hide. A graphic T like the model is wearing is cool and really in just now but I'd love it with a denim jumpsuit or dungarees for a bit more contrast. I stumbled across these matte pleated trousers and literally thought they were the coolest thing ever. Matte AND pleated...are we ok? YES. These are perfect if you love pink but are a bit worried to venture into new bold trends just yet. I don't know anyone that hasn't got a black silky pair of these or has at least tried some on. Fab for all weather and occasions. Trainers, heels, sandals, mules: all of them will go. I'm really not a skirt kind of girl but this is really really cool. The asymmetric line across the hip with the zip is definitely worth a try. It's a bit more Gigi than your normal pencil skirt that just reminds you of a news presenter. The model is wearing it with a simple grey tank but i'd love it with a super pale pink half tucked jumper and accessorise with an over the top embellished side bag or crazy textures.